Don't forget the fitting gift. 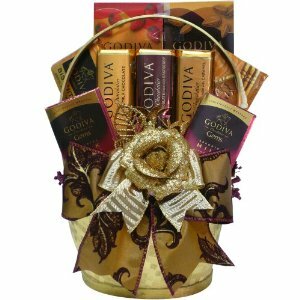 This Art of Appreciation gift basket filled with Godiva Gold Premium Chocolate is a good choice. Is the bride a member of the Chocolate of the Month Club? If she is a real chocolate lover then throwing a chocolate themed bridal shower may be a fun idea. How do you know if your guest of honor is a real chocolate lover? Have her make a list of the top ten things she can't live without. If chocolate is in the top five then you know you got a chocolate addict on your hands. At this point it is safe to say that she will love the idea. This is also a good way to come up with a theme for the bridal shower if you're stumped. Since invitations are usually selected based on the theme of the party you will want to pick something that says chocolate. This can be through color, imagery, shape, etc.. Here are a few invitations that will get you started. Picking the decorations for this type of party is always fun, hint they can be edible. Since the color theme will be brown spice it up with streaks of silver. This can be silver steamers, silver glitter etc.. Balloons are an important part of any shower this one is no exception. Here is a trick that I like when I throw a party with this theme. After you've blown up all of your balloons lightly coat them with hair spray, then dip them in a container with silver glitter. This is best done outside or in the garage since it tends to get messy. After they are dry and you've shaken off the excess glitter you can hang them up around your home. Warning you will find some glitter in your home for a few weeks, especially if one pops or you hang them where people will bump into them. When you play your games why not incorporate some chocolate themed games? One fun game is played like Scrabble. Take a number of words, no more than ten or your game will run too long, and scramble the letters. The easiest way to do this is in a word processor and then print them out. The printout can be festive and in the same theme. Make sure to place each scrambled word on its own line, giving your guest plenty of room to write. Here is an easy example that gives you the idea. Alccohoet would be chocolate. The first person to get all ten words wins a prize. If you're looking for more game ideas we've got you covered. Try our Top 10 Bridal Shower Games page for some fun and easy entertainment. For food you may want to make some choices that balance out the theme. If not you run the risk of sending your friends and family home with chocolate overload. Instead of only offering chocolate related snacks mix in some nuts or pretzels. Sweet and salty are always a winning combination and your guests will appreciate the variation. Still it is safe to offer a chocolate cake, something fun and rich is a good choice. You can get some cake ideas here. When it comes to chocolate themed showers remember nothing is too outlandish or decadent. If your heart says chocolate fountain listen.